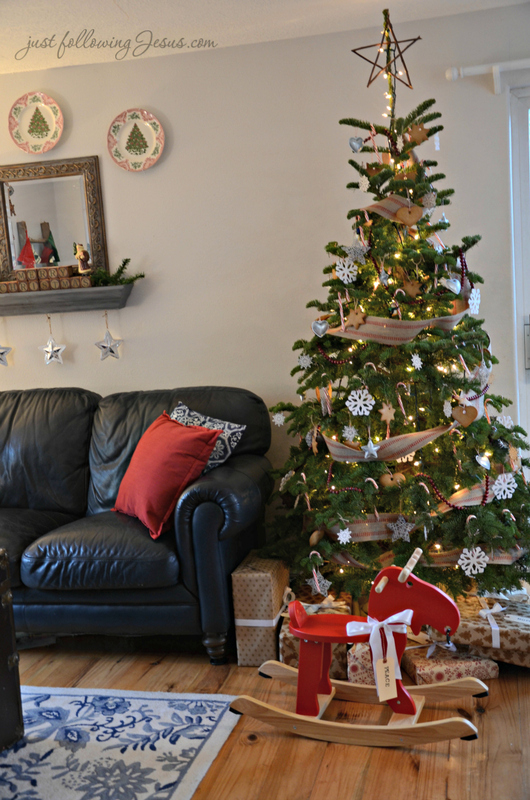 The presents are all purchased,wrapped and under the tree. Our tradition is to never tag who the gifts are for, but to use different wrapping paper for each person. Trying to figure out which gifts were for who was always fun for our daughters when they were young. Now that we are also buying for sons-in-law and grandchildren it can get confusing. I almost need a chart to help me remember! "Now who gets the wrap with the gingerbread cookies on it?" White satin ribbon, found in the wedding section of the Dollar Tree, is my ribbon of choice for several years now. are another hint about who the gift is for. I like the homespun look of brown paper packages with some type of simple pattern on them. Tomorrow the last of the Christmas cards will go in the mail. Then I will do some holiday baking. I'm grateful that I got all of the shopping done early this year. Just turned one year old granddaughter and her big sister have already taken a few pre-Christmas test drives on the youngest's Christmas gift, a rocking moose. I hope you are enjoying this last week before the Big Day! Hope your Christmas is so joyful--looks like it is going to be--love the packages too! 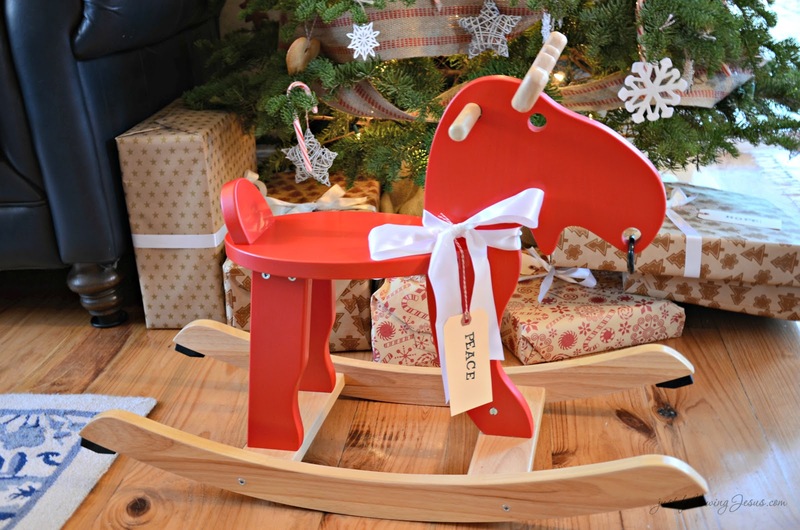 That rocking moose is just about the cutest thing I've seen! Your grandbaby is going to have such fun. 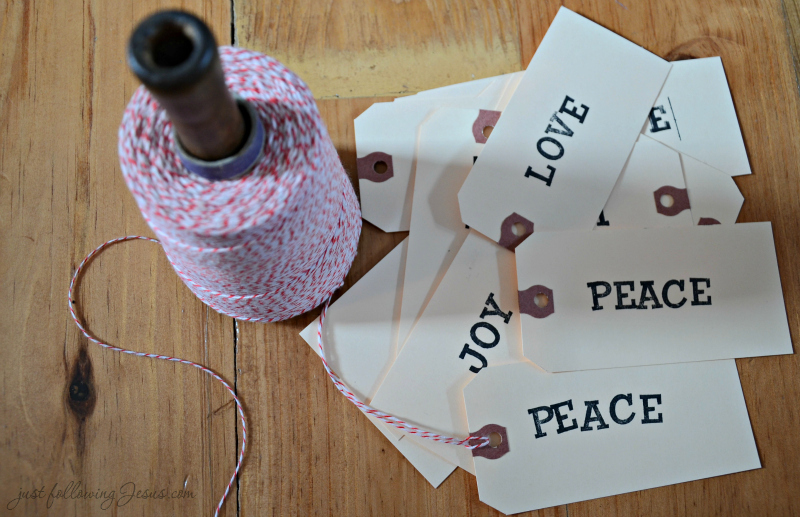 I love the paper and tags you've chosen and it's such fun to leave names off the gifts. What fun it must be for the kids. I love how you use different wrapping paper for each person. How creative. 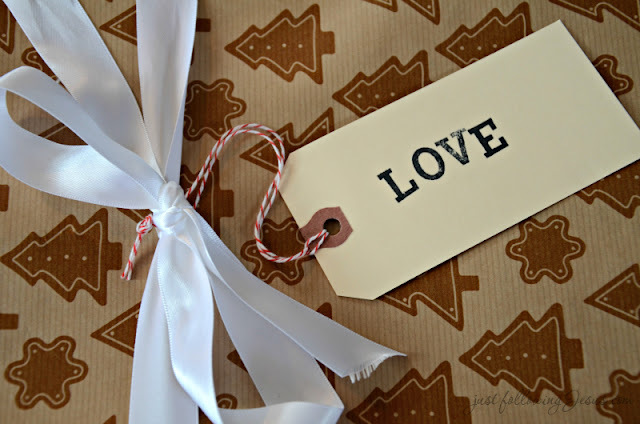 I am afraid I would surely forget whose gifts were whose! I like your tradition too. My tradition is to wrap packages as quickly as possible and not use any ribbon, and to write the recipients' name somewhere on the package with a Sharpie. Since I am fairly detail-oriented in other matters, my family is amused by this laziness, and I am a little (but apparently not sufficiently) ashamed. I love your unique rocking moose! He is a very Christmassy looking beast. That's a great idea to use different paper per person..I may try that next year. Merry Christmas to you and your family Elizabeth! So appreciating the sweet, simple beauty here. The papers, the words of hope and truth and light. Thank you, Elizabeth. I love the rocking moose! 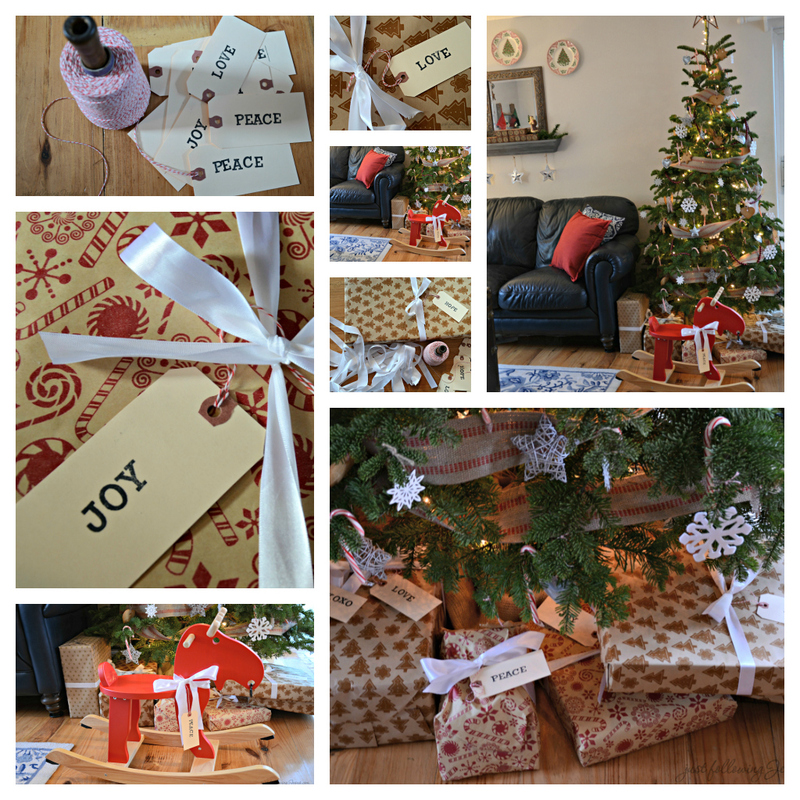 What a sweet tradition... the presents all look beautiful, especially with the sweet, simple tags. Merry Christmas! Yes, I am enjoying this last week before Christmas! Savoring it, in fact. As you are! The gifts and ribbon look lovely. I do the same thing...one paper for each person. (But I don't think anyone else really knows it! How pretty! 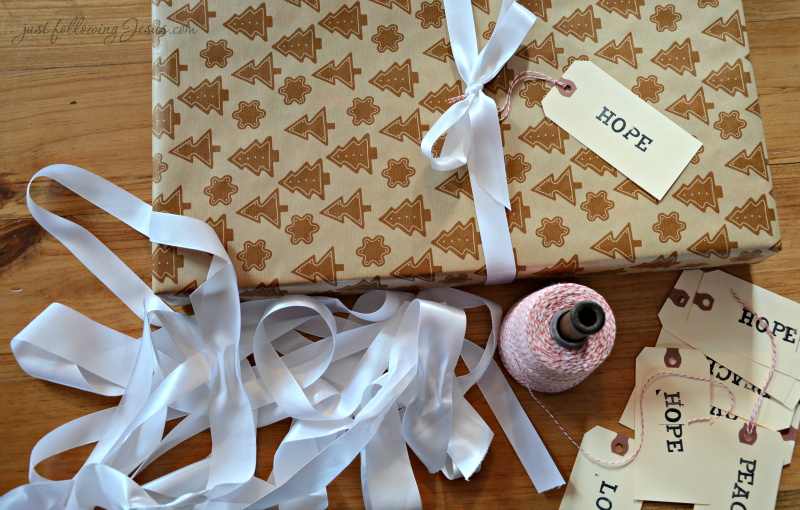 The wrapping paper and gift tags are so pretty! 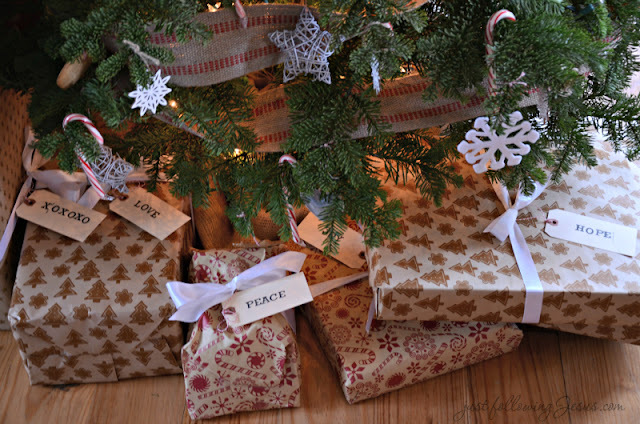 Love the tree wrapping paper! Hope you have a Merry Christmas! I love it! 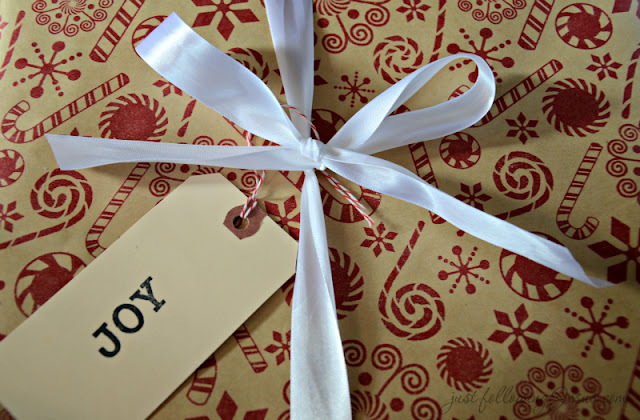 I've used variations of this for a few years: brown kraft paper for wrapping and hand-stamped tags.